The re-design and re-organisation of the Urban section is now finished. There are a few new sections as well: Building for Utopia showcases surrealism in architecture; Paris B&W contains black & white wide-angle photos taken with the Holga 120WPC, and the two Where Angels Tread sets feature images of cemeteries. Enjoy. During the last week of September, which turned out to be the last week of summer, I shot a couple more rolls with the wide angle Holga, the 120WPC. I’ve uploaded a few to my Holga page (check the Wide Angle Berlin link) and a few more to the flickr gallery. Enjoy. 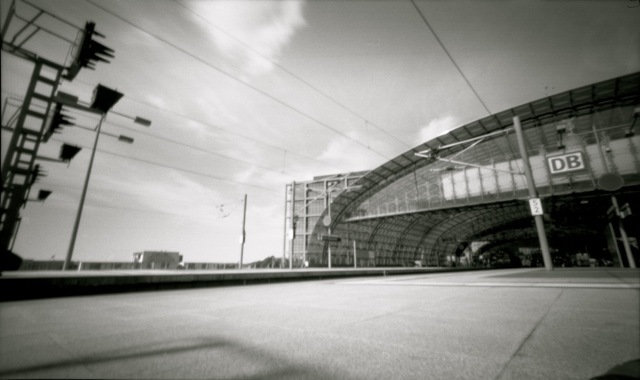 A selection of photographs taken with the wide angle pinhole Holga 120WPC camera is now up on the Always Arriving site. The gallery can be accessed from the Holga and from the Urban page. A new camera joined my collection of “low fi” equipment, this time around a Holga 120WPC, which is a wide angle pinhole camera (i.e. it’s got no lens). I took it out for a spin to Berlin’s main station, and the first pics turned out really well. I used the 6×8 format, next time around I’ll be trying the 6×12 format, and colour. I’ve posted a selection of the pics on flickr. Enjoy and let me know what you think. Addendum: here is a very good review of the Holga 120WPC at Holgablog.